Good Cook's Colander Bowl Set is the perfect starter pack for home cooking. Oblong shaped, this set includes three sizes. The small colander features an extended handle and is perfect for straining berries. The clever nesting design allows for compact and easy storage. The extra-flared rim design allows for easy pouring and prevents spills, while the dual handle colanders have a non-slip base. This set is great for those whose cabinet space is at a premium, or anyone who just wants a nice, sturdy colander set. 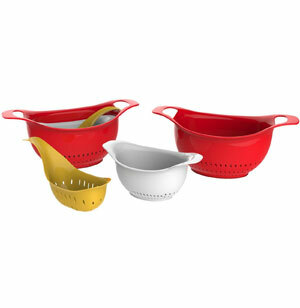 This Nesting Colander Set will help you quickly rinse anything with ease!